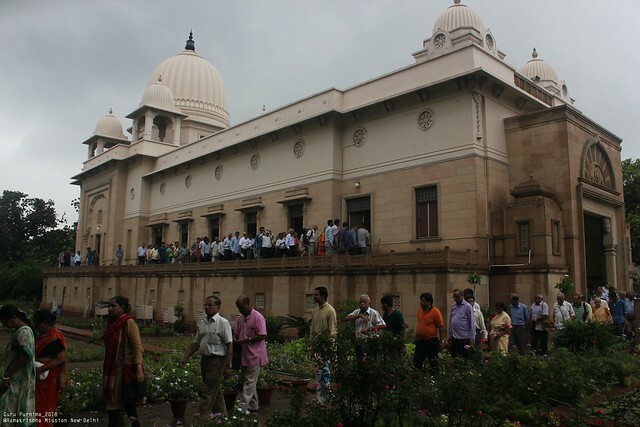 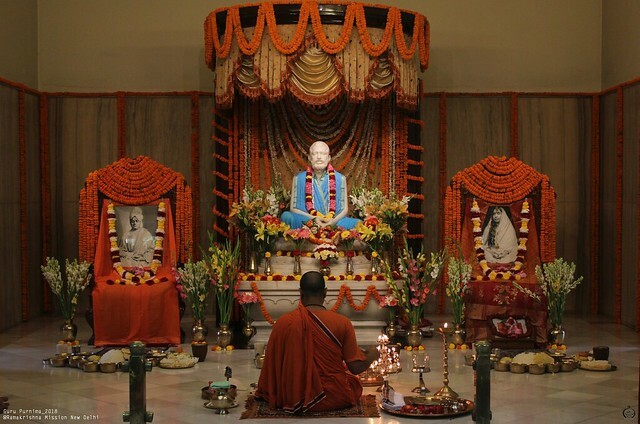 Guru Purnima was celebrated at the Ramakrishna Mission, New Delhi, on Friday, the 27th July 2018, by devotees with great fervour. 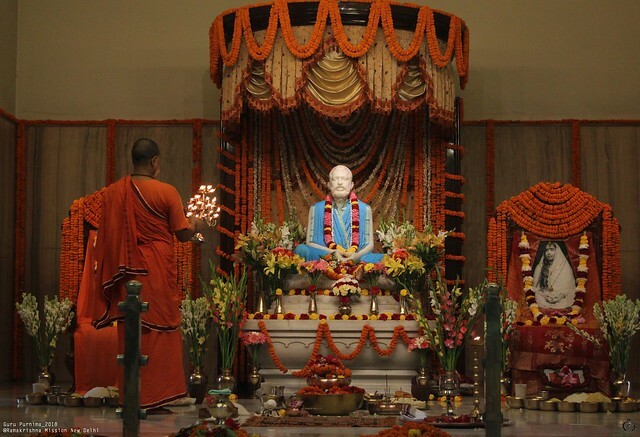 Bhagavan Sri Ramakrishna is regarded as both the Lord and Guru in one, and therefore addressed as ‘Thakur’ and ‘Guru Maharaj’ by all devotees of Ramakrishna Maths and Missions. 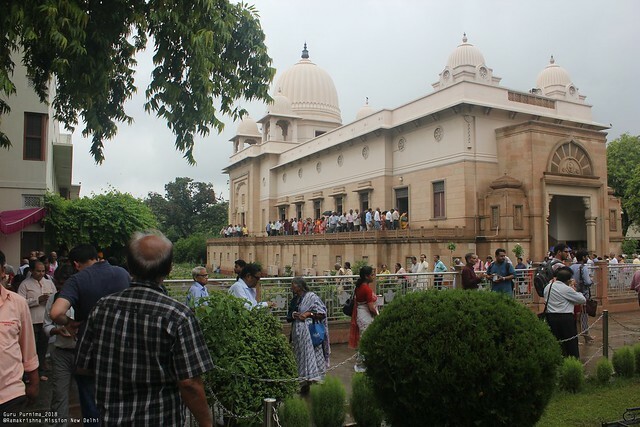 The day started with a ‘Sehnai’ recital and main gate of the Temple was opened for devotees from 4.50 a.m. ‘Mangalarati’ started at 5.00 a.m. after the blowing of conch shell (shankh). 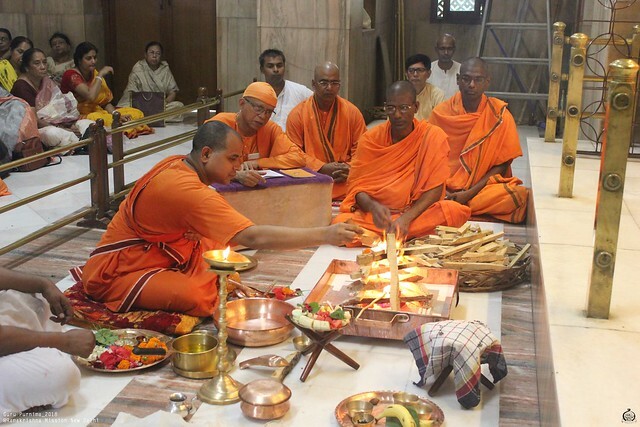 It is performed with camphor lamp. 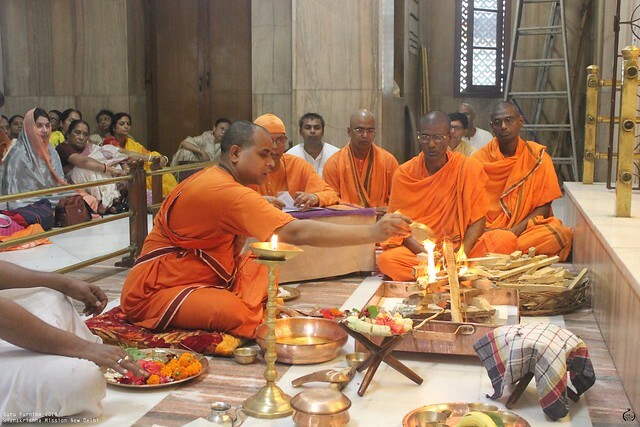 This was followed by Vedic Chanting by the monastics of the Order. 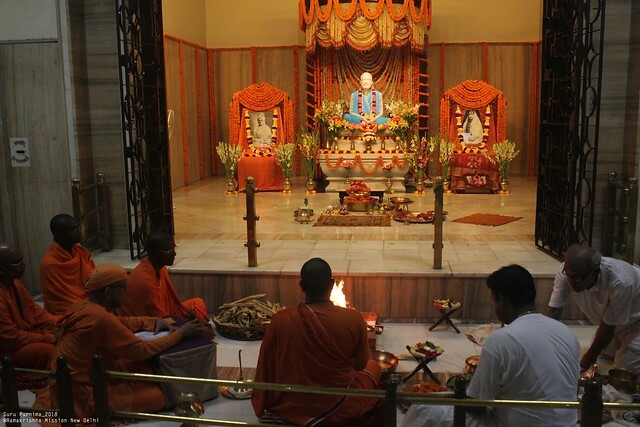 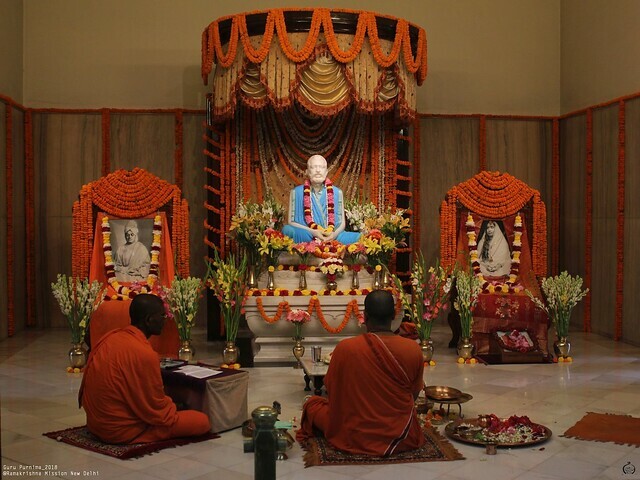 The Special Puja in the Temple performed by Swami Amritamayananda (Swarupananda Maharaj). 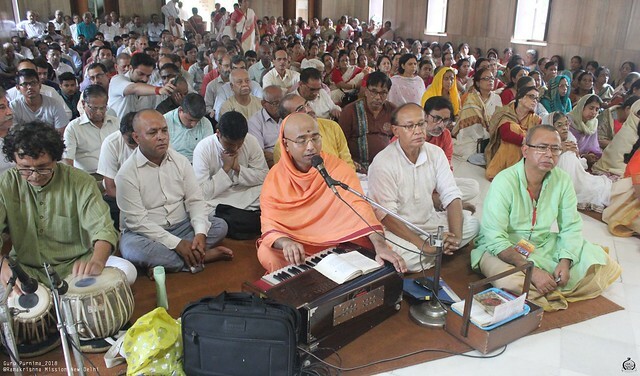 Devotional songs were rendered by Revered Secretary Maharaj, Swami Dhruvarupananda (Manavendra Maharaj), Shri Champak Chatterjee and Shri Chandranath Mukherjee accompanied by Shri Siddharth Bhattacharya on tabla. 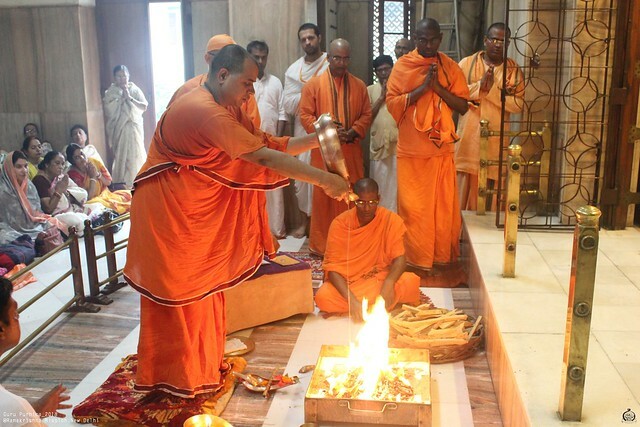 Homa was also performed by Swami Amritamayananda assisted by Rev. 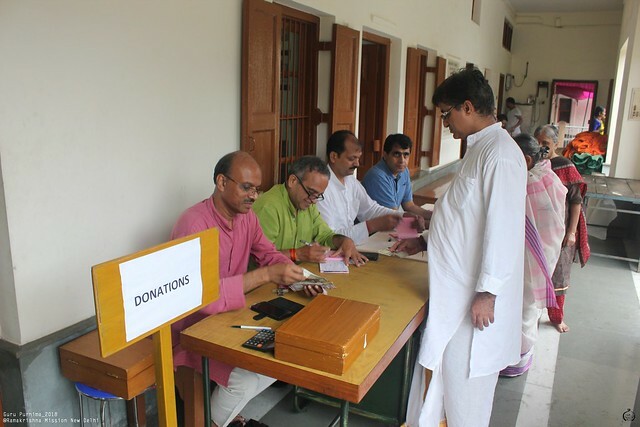 Secretary Maharaj accompanied by Swami Kapilananda and a few volunteers. 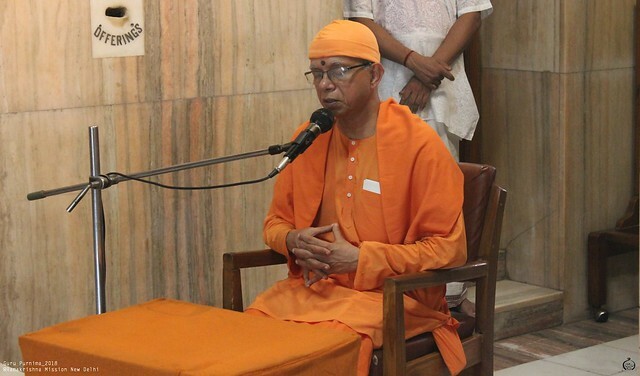 Revered Secretary Maharaj rendered devotional songs followed by Swami Dhruvarupananda. 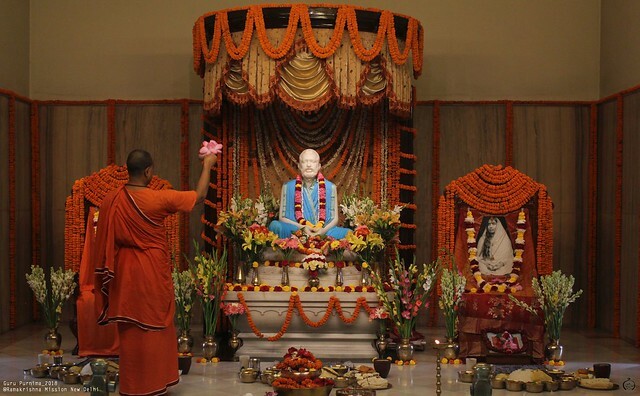 Pushpanjali and pranam mantra was also administered by him. 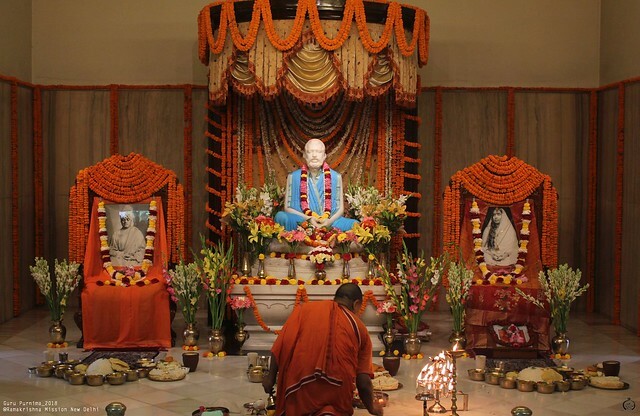 Afterwards, Rev. 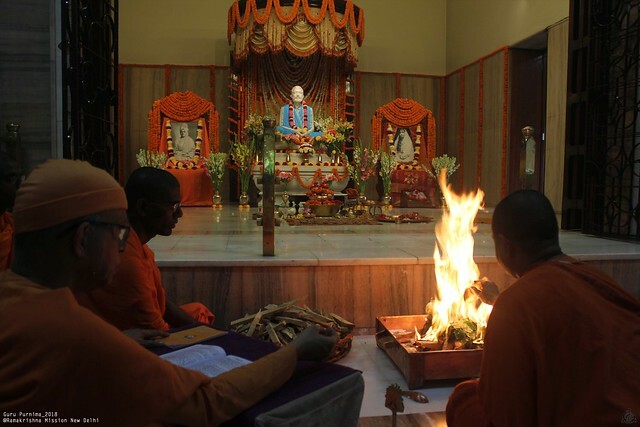 Secretary Maharaj gave a short discourse highlighting the importance of Guru in one’s life. 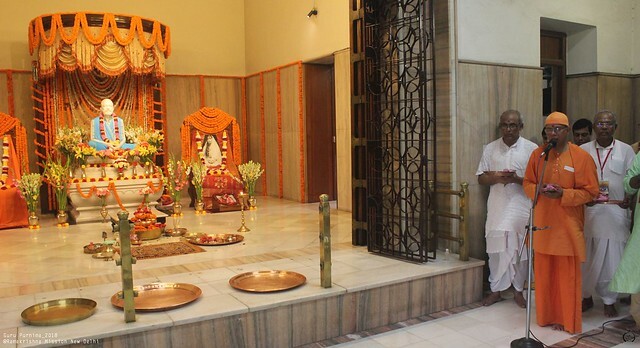 During that period, the doors of the sanctum sanctorum were closed and Bhoga was offered to Sri Sri Thakur, Ma and Swamiji. 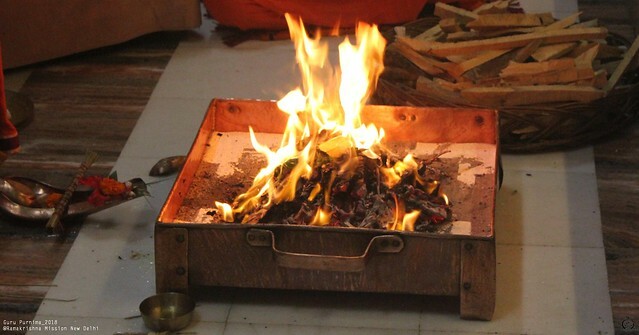 After the bhoga was over , Arati was done by Swami Amritamayananda and aratrikam songs were rendered in chorus by all devotees led by Swami Dhruvarupananda. 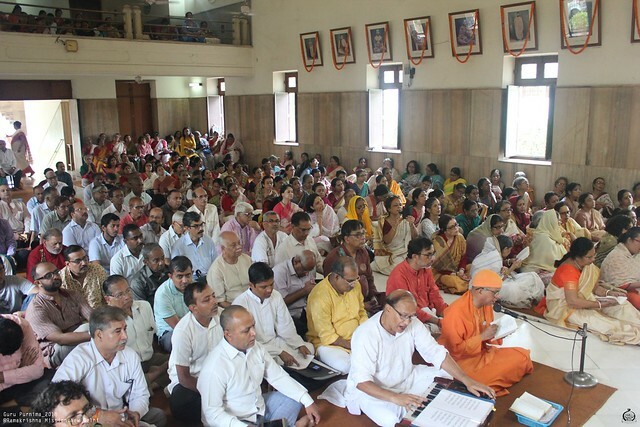 All the devotees offered pranams to Sri Sri Thakur, Ma and Swamiji. 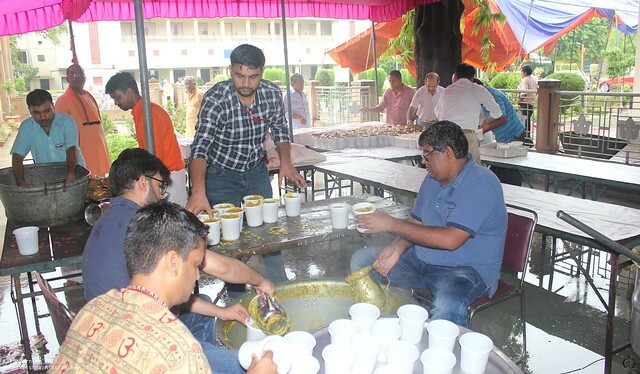 When the devotees came out of the temple, they were served charanamrita and havan tilak in the lawns by volunteers. 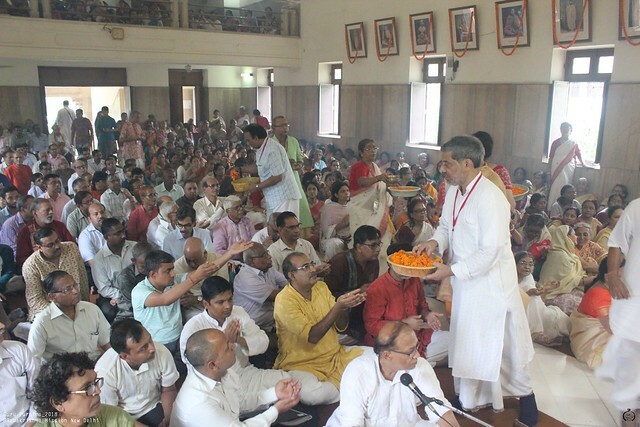 Many of the devotees who attended the puja also offered pranams to Revered Secretary Maharaj. 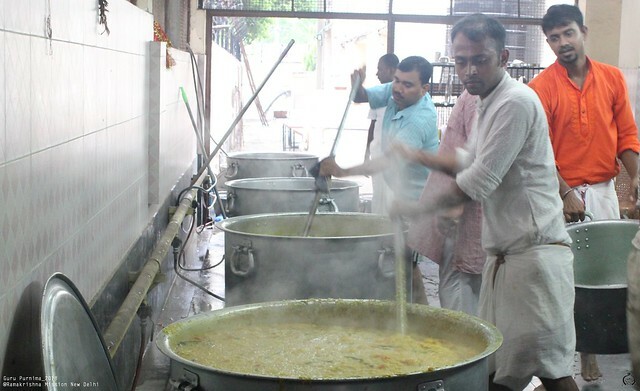 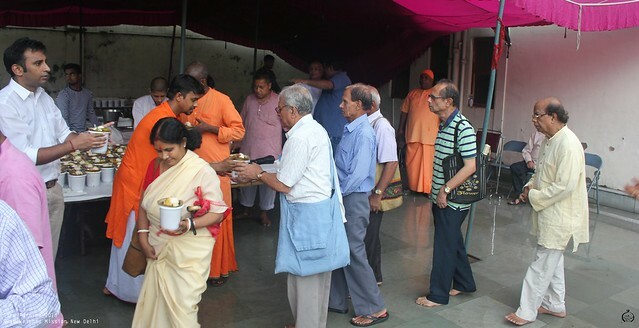 After the puja, devotees partook of the cooked Prasad.